The Catholic Church does not give specific remedies to the problems of our world, grave or small, but it teaches about Christ who is the Light of the world and shows us how to live as children of God. The pope, as the head of the Church, invites us to a deeper encounter with Christ and his Church. At the same time the pope asks us to acknowledge some moral truths derived from Christ’s teaching: peace among nations, service to the poor and marginalized people, respect for the marriage and the family, care for our common home. Today Pope Francis addressed the joint Houses of Congress and the Supreme Court as a head of state. This was the first time of such an event. Speaking in English the Pope greeted Congress and the people of the U.S., “… the land of the free and the home of the brave.” He reminded the members of Congress that they are called to defend and preserve the dignity of their fellow citizens in the tireless pursuit of the common good. He spoke of Moses who leads us directly to God and transcendent dignity of every human being. He told the congressmen how they are charged to respect the image of God in every man. The Pope invited a dialogue with men and women who with their work sustain the life of society through their work and the organizations they are part of, the elderly who share their wisdom and serve others through voluntary work, and with all. Those who have served the American people at the cost and sacrifice of their lives teach us. The Pope singled out four people: Abraham Lincoln, Martin Luther King, Dorothy Day and Thomas Merton. Lincoln labored tirelessly that this nation would live in freedom. Our world today is an increasing place of violence and religion is abused by some. We must oppose fundamentalism, religious or of other types, safeguarding religious and intellectual freedom. But he warned us of a polarization between good and evil. Our response should be one of hope and healing, peace and justice, resolving today’s economic and geopolitical problems and injustices. We must restore hope and move forward as one working together for the common good. We must respect our differences and convictions of conscience aware of how in our lands the different religions has greatly contributed. We must continue to listen to the voice of religion which is a powerful resource against new sources of slavery and injustice. The pope acknowledged the difficulty this involves but encouraged us in this effort. The Pope referred to Martin Luther King’s march 50 years ago to obtain full rights for African-Americans. This dream continues to inspire us, and he expressed his happiness that America continues to be a land of dreams. Dreams that lead to action, to participation and to commitment. Millions of people came to this land pursuing dreams. The people of this country are not fearful of foreigners because most of us were once foreigners. 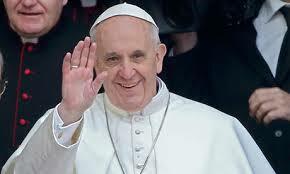 The pope recalled that he was a son of an immigrant. Tragically the lives of those who were here before were not always respected. The pope expressed his esteem for them while noting that it is very difficult to judge the past. We must resolve to live as justly as possible, constantly relating to others and rejecting a mindset of hostility. He invited us to live in a spirit of reciprocal subsidiarity. The pope spoke of the magnitude and tragedy of refugee crises and of the many people coming to the United States seeking a better life for themselves and their loved ones. We must not consider them as numbers but as persons. We must see their faces and listen to their stories. The pope invited us to remember the Golden Rule: Do unto others what you would like to have done unto you. He reminded us to use the same yardstick for others that will be used for us. We must protect and defend human life at every stage of its development. This extends to the effort to abolish the death penalty, and goal of rehabilitation. The pope also spoke of the example of the Servant of God Dorothy Day, founder of the Catholic Worker Movement. Her social activism and passion for justice was inspired by the Gospel. We know much more must be done for social solidarity. The fight against poverty must be fought on many fronts. He also spoke of care for the earth, our common home – the subject of his recent encyclical – to direct our steps avoiding the deterioration of the environment caused by human activity. We can make a difference. The U.S. institutions can make a vital contribution in the years ahead. The life and story of Thomas Merton served Pope Francis to speak about prayer. Merton was a man open to dialogue and a promoter of peace and people of different religions. In the face of failed peace processes we need to seek new opportunities of dialogue requiring courage and daring. We have to minimize and seek to end armed conflicts throughout our world, and ask why deadly weapons are sold to those who plan to inflict untold suffering on others. He ended speaking about the essential role of marriage and families in the building of this country and its culture, receiving a large ovation for his comments. This wise address to our nations leaders recalls the addresses of Paul VI, John Paul II and Benedict XVI in their visits to the US. It was an invitation to justice and charity, respect for human life and the family. Christianity has always influenced the moral customs and legislations of nations. In his time in the 19th century England’s Blessed John Henry Newman helped educated lay men to work in the field of education, defend the institution of marriage and protect the religious freedom of the Anglican community and later the Roman Catholic Church. Newman from an early age lived by what he called doctrinal principle, the understanding that religion is based on objective truths revealed by God, not subject to opinions or consensus. Newman’s guiding principle is so important for contemporary society is faced with a crisis of reason: a skepticism about knowledge of the truth. But for Newman religious truths translated into charity with the poor, the sick, the perplexed and sorrowful. It is the saints and other holy men and women who show us with their action and their words how to live the Faith and transmit it to others. The Pope’s example and words are an invitation for each one of us live the Faith better with respect for all, cooperating with others in the care of the poor and the immigrant, working for peace in our world and protecting our common home. From the other side of your world, and the 24-hr news cycle where mere seconds represent dollars, it is often difficult to read an entire dialogue such as the above.Thank you for your comprehensive report on Pope Francis’ speech. We are all called to think more wisely and deeply about our personal obligations to our God and the wonderful faith he has bequeathed us; if only all of humanity could embrace it. It was pleasing to read on this occasion that the Holy Father confined his call for us to work harder to protect our environment, rather than delve into the scientific dispute over “climate change” – as some do, whilst giving the impression that climate change is some sort of new phenomenon. The real issue is whether the economic and industrial development of our western world has, and will in the future, increase global temperatures to an alarming level. Almost all of the alarmism over this claim has been based on long-term computer projections which began some three decades ago. However, the average of the more than 20 climate scientific papers published in recent times on climate sensitivity (that is the projected increase in global temperatures by 2100 from a projected doubling of CO2 emissions) is about 1.2C rather than IPCC computer projections of up to 4.5C, so that long term computer projections are not only failing to be substantiated by most recent research, but by observation, where actual global temperatures scientifically measured by satellites covering some 97% of the globe, show that there has been no actual increase in global temperatures for well over 18 years, and no statistically significant increase for over a quarter of a century. We must be careful then to familiarise ourselves with more recent scientific facts, rather than alarmist propaganda, warning of massive temperature increases, rising sea levels etc. The other thing that concerns me, is that new technology can accommodate coal fired energy with almost no CO2 emissions (which incidentally is less than 4% of our atmosphere’s molecules, and which is 1000 times less impotent as a greenhouse gas than ubiquitous water vapour), so that confining poorer populations like those of India, Africa, Asia and South America to infinitely more costly renewable energy sources that contribute a small fraction to meeting energy demands, as against low cost and CO2 free coal, seems to hit more at the poor than the wealthy. Kevin, thank you for your important comment and explanation. I was relieved that the Holy Father did not refer to climate change when he spoke about care for our common home and environment to the United Nations. As you point out there is well grounded dispute over “climate change” and the Church should not base its arguments on scientific “theories” or advocate any specific technologies. Despite this unfortunate section in the recent encyclical its theological truths and arguments are solid and necessary, and it urges us to work for an integral human ecology (or development as Pope Paul VI had said before). Was reading and thinking of your contribution to university students as well. Heard your interview the other day. I used to recruit people to pray for priests under the Serra Club. Thank you for your posts. Really love reading them and keeping myself updated. Thank you Jo. I appreciate your interest. Blessed Newman can help many to deepen their faith and love for God.